Budget airline Ryanair has become the first carrier to offer in-flight mobile phone services on regular routes across UK airspace. It has installed the technology on 20 aircraft - including those serving the London to Dublin routes - and plans to upgrade its entire 170-strong fleet. Calls will cost between £1.50 and £3 per minute, e-mails from £1 to £2 and texts about 40p. The Air Transport Users Council has given the move a cautious welcome. A Ryanair spokesman said passengers on routes between Dublin and the London-area airports at Gatwick, Stansted and Luton can use the service. Availability elsewhere depends on fleet distribution. A maximum of six people will be allowed to make calls at a time, although this is likely to increase, with charges depending on the network operator. People on the Vodafone and O2 networks are currently able to use the service, while Ryanair is negotiating with other operators. Would you pay extra to use your mobile phone on a plane? A charge will also be levied to receive a call, but not a text message, and the service will only be switched on above 10,000ft (3,000m). Chief executive Michael O'Leary said: "It will be very welcome for people who want to make and receive urgent or important calls. "I think the big users here would be teenagers, people generally visiting friends and family." He dismissed suggestions that the service might annoy people hoping for quiet but said plans to fit equipment to the entire fleet within 18 months could be scrapped if it did not prove popular. Mobile phone use has long been banned aboard aircraft because of evidence it interfered with onboard communication and navigation systems. Research published in 2003 by the Civil Aviation Authority found mobile phone signals skewed navigation bearing displays by up to five degrees. But new technology - like that developed for Ryanair by Swiss firm OnAir - weakens the signal from phones to prevent this, and transfers calls, texts and e-mails to a satellite. Similar equipment has been used by Emirates since March last year and many southern hemisphere airlines have been quick to follow suit. It prompted UK communications watchdog Ofcom to permit the use of mobiles in aircraft last year, while the European authorities also relaxed rules on their use within EU airspace. The technology was first used on a UK-bound flight last August, when Emirates passengers were able to make calls on board a Dubai to London Heathrow service. BMI began trialling a text and e-mail-only service on one craft on its London Heathrow to Moscow route in December and BA plans a similar move for its London City to New York JFK business class-only services later this year. But the Ryanair service is the first to be widely and regularly available in the UK. The Air Transport Users Council expects more UK carriers to follow. 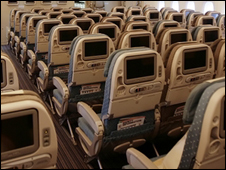 Industry affairs manager James Fremantle said: "In general, on short-haul flights, it's a good thing. "Business people want to be in touch with their affairs, while other passengers can get hold of people on the ground if their flight is delayed or diverted. "Our request to the airlines is not to forget the people who don't want it and try to bring in a code of practice to limit disruption to other passengers by only allowing its use at certain times of the flight, for example."